Subscribers to Everything Dinosaur’s newsletter received their latest bulletin a few days ago. They were amongst the first to know about the arrival of the latest batch of new for 2018 Papo figures as well as the shipment of CollectA models including the 1:40 scale Mapusaurus figure. In addition, our newsletter featured an update on the latest offerings from Rebor. New for 2018 Papo Therizinosaurus and Papo Iguanodon dinosaur models in stock at Everything Dinosaur. Everything Dinosaur customers who had requested a Papo model be put on reserve for them have already been contacted by staff members. Five new CollectA prehistoric animal figures have arrived. There are 1:40 scale figures of the fearsome Mapusaurus and a beautiful Iguanodon. In addition, CollectA have introduced a 1:20 scale replica of the giant Devonian Placoderm Dunkleosteus and just like the amazing Mapusaurus, it too has a movable jaw. New for 2018 CollectA prehistoric animals. 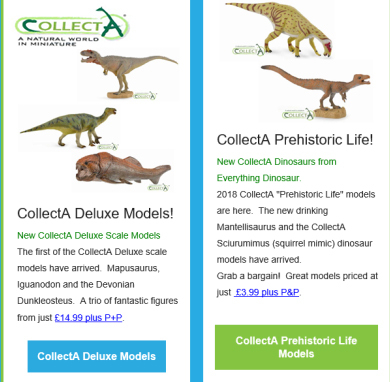 As well as the new scale models from CollectA, our latest bulletin included details of the two new, not-to-scale dinosaur figures that have just come out. The drinking Mantellisaurus has been eagerly anticipated by model collectors and joining this Ornithopod, is a model of the bizarre, carnivore Sciurumimus, that despite being only known from a 70 cm long skeleton, may actually represent one of the largest types of Theropod from Jurassic Europe. Rebor continue to innovate and have added an amazing dinosaur embryo figure to the company’s “Oddities” range. This cleverly designed item is a fantastic model of a genetically modified baby dinosaur. The Rebor Chickenosaurus is supplied with a battery and has a light-up base and it makes a real focal point within a model collection. Rebor “Chickenosaurus” and the 3-D Utahraptor poster. Rebor has introduced a three-dimensional poster of the Utahraptor figure “Wind Hunter” produced by the company. This poster, the first to be made by Rebor, is also available from Everything Dinosaur. This colourful and very striking dinosaur poster measures 26.5 cm by 20 cm (including the frame) and it is a limited-edition item. It makes a smashing backdrop to the 1:35 scale Rebor Utahraptor ostrommaysorum figure.